A housing moratorium on San Francisco’s November ballot is aimed at keeping rents and housing prices affordable in the city’s Mission District, where prices have nearly doubled in five years. But opponents say it will have the opposite effect. Proposition I would forbid the city from issuing permits for 18 months for the demolition, conversion or construction of Mission District housing projects with five or more units. It places a similar ban on certain Mission commercial properties, including wholesalers and auto repair shops – unless the business is replaced with a 100 percent affordable housing project. The measure’s proponents are concerned that long-time residents can no longer afford to stay in San Francisco as rents and housing prices skyrocket. There were 2,120 eviction notices filed in San Francisco from March 2014 through February 2015, according to the latest San Francisco Rent Board Annual Eviction Report. That represents a 67 percent increase from 2010. In 16 percent of the latest evictions, tenants were replaced by building owners or their relatives, up from 9 percent in 2010. Supervisor Eric Mar, speaking at the June 2 Board of Supervisors meeting in which a moratorium ordinance was debated, said he is concerned that too many minorities are being pushed out of the Mission District. Seven of the 11 supervisors voted for the moratorium, falling short of the nine votes needed to pass. After the moratorium failed before the board, activists gathered enough signatures to place it on the ballot. It would be a repeat of the displacement of Filipinos from the city’s Manila Town in the 1970s, he said, and of blacks from the Fillmore District in the 1950s and ‘60s due to urban renewal. “I call this ethnic cleansing because we know that in the past decades the African American population has been pushed out with unchecked out-migration that’s left us with the lowest number of African Americans of any large city in the country,” said Mar. But the supervisors who voted against the moratorium argued that it would actually result in the opposite of its intended effect by further limiting housing supply and driving up prices. The city would forego certain fees on new development that boost affordable housing. “Whether or not we like it, market-rate housing right now in San Francisco is directly tied to the production of affordable housing,” said Supervisor Mark Farrell. “By stopping market-rate construction, the facts are that you are directly taking away from one of the primary resources the city has, over $100 million in the next few years, to create affordable housing in our city. Farrell blames the city’s regulatory policies for causing the housing crisis. The city’s population was 852,469 last year – a 5.9 percent increase since 2010. During the same period the number of housing units increased at less than half that rate, 2.5 percent, according to census data. The Mission District has added about 100 units annually in that time. The Mission, which is a short bus or BART ride from jobs in the financial district and Giants games at AT&T Park, is known for its ethnic restaurants and lively music and arts scene. As with all of San Francisco, housing prices and rents have exploded in the Mission District in recent years. The median price of a Mission District home was $1.3 million as of March 31. That’s nearly double the $700,111 median price five years ago, according to a legislative analyst’s report. The average rent for a two-bedroom apartment in the Mission District is $4,500 per month, according to Supervisor David Campos, whose district includes the Mission. 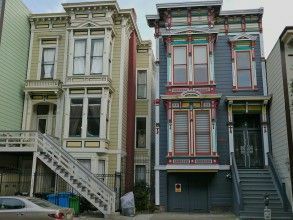 The median household income in the Mission District is $60,156, according to the realtors association. If that household were living in an average two-bedroom apartment in the Mission, it would have just over $6,000 for all other expenses, including food, utilities and health care, over the course of a year. “Middle and working class people, the very people who have made the Mission what it is today, are having a hard time staying in this community,” Campos said. “They can no longer afford to live here. Housing is no longer affordable to the very people who made the community the unique and wonderful place that it is. The board room, the hallway outside the chambers and an overflow room were packed with Mission residents and anti-displacement activists, who frequently disrupted the meeting with applause, hissing and chanting. The public comments portion of the meeting lasted seven hours. Proposition I states that the moratorium could be extended an extra year with a majority vote of the supervisors. It also requires development of a plan to ensure that at least half of new housing in the Mission is affordable for low, moderate and middle-income households. As part of that plan, Campos has said he would want the city to increase fees on developers and target for affordable housing the remaining 13 sites in the Mission where buildings with 40 or more units can be built. Developers of housing projects with 10 or more units are required to reserve 12 percent of their units for affordable housing or pay in-lieu fees for the city to build affordable housing projects. There are currently 1,574 units slated to be built in the Mission District, according to AnMarie Rodgers, a senior policy advisor in the San Francisco Planning Department. If built, those projects would bring the equivalent of 189 new affordable housing units to the market, or $2 million in fees. In addition to providing affordable housing, the fees on new development also help pay for other city projects. The moratorium would eliminate nearly $125 million in funding slated for improvements in Mission area rapid transit, an aquatic center, park, playgrounds and a recreation center, according to Rodgers. Several measures are underway to increase affordable housing in San Francisco. Last year voters passed Proposition K, which makes it city policy to help construct or rehabilitate at least 30,000 homes by 2020. More than half must be affordable for middle-class households, or 120-150 percent of the area median income. The median income is $61,160 for a family of four. At least a third must be affordable for low-income households, or 50-80 percent of median, and moderate-income, 80-120 percent of median. Proposition A, a $310 million affordable housing bond measure, is on this November’s ballot. Mayor Ed Lee is working to recapture $500 million of the city’s dissolved redevelopment funds. That would increase the affordable housing budget to $1.6 billion over the next six years, according to Olson Lee, director of the Mayor’s Office of Housing and Community Development. The mayor’s staff is also looking at administrative measures to speed up approval of affordable housing projects. The administration is considering incentives such as allowing higher density or taller buildings in exchange for more affordable units. Proposition I appears to have a good chance to pass if a poll taken in February is accurate. It showed 65 percent support for a ballot measure halting new project approvals in the Mission District for one year, according to the San Francisco Examiner. Only 26 percent were opposed.